It was about time we tried some Bowmore again. Because Bowmore is a must-taste at any serious blogging entity, whether it’s independent or industry-embedded. No? Bowmore 17 yo ‘White Sands’ (43%, OB, +/-2017) This is exactly not what Bowmore are doing, but we’ve noticed that some distillers were launching a new, for example ’15 years old John Smith Edition’, only to drop the age statement a few months/years later, coming up simply with a ‘John Smith Edition’. Many people will be completely fooled – but of course not us, eh! Colour: gold. Nose: it’s relatively round and even fattish for Bowmore, with rather more custard and syrups than usual, and more sweet oak and soft fruits. So do not expect any peaty or coastal blast, although it does have such notes. Kelp, smoked fish… It’s just soft and rather discreet, a trend that can be spotted elsewhere on the island. Mouth: really soft, but well balanced. There’s some fresh oak, with vanilla, coconut water and pineapple (that pina colada effect from active American oak), then quite some soft sunflower oil, and just a touch of salt/brine. Finish: medium, fruity, easy. Comments: totally not one of our beloved blade-y Bowmores, and it does feel a tad ‘lab’, but it just won’t infuriate anyone. Very easy on the smoke. Good easy Bowmore for everyone. SGP:643 - 81 points. Bowmore 18 yo (43%, OB, +/-2017) Still the older livery. An arch-classic Bowmore. Some periods have been difficult (terrible in the early 2010s), but I noticed very recent batches were recovering fast. There’s also a newish ‘deep and complex’ version around, but that should not suggest the regular 18 is neither deep not complex. Well, I suppose, let’s see… Colour: deep gold. Nose: no f**** lavender that I can detect, those years were over when this was distilled. Phew! Smoked oranges, blond tobacco, dried kelp, blood oranges, a little olive brine, and just a little caramel ‘from the pan’. 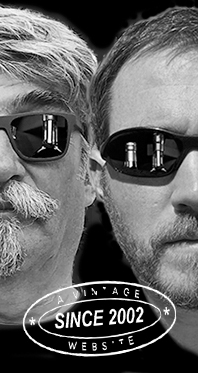 Mouth: do I notice some nods to Lagavulin 16? Same kind of orange-y, leathery, tobacco-ish, salty arrival, then many oranges. This is much peatier than that White Sands, much fuller, and much more assertive, as they say. Finish: rather long, full, on some kind of salty oranges. Comments: full form again, I do confirm. Well, only a personal opinion, as always. And adios lavender, and adios violets. SGP:555 - 87 points. Bowmore 10 yo 'Tempest' (54.9%, OB, Batch #6, 2015) Yes I’m late. Remember, the Tempests are all ex- 1st fill bourbon cask, but I thought quality had dropped a bit between batches 1 and 4. Colour: straw. Nose: not complex, even a little simple, but there’s a nice balance between the mango-ish side and smoky/briny one. Sauvignon Blanc. With water: easier on the tropics and with more Islayness. I’m meaning burning seaweed and such. Now a little coconut remains there, and that’s the oak. Mouth (neat): maybe a bit heavy on the oak indeed. A lot of pinesap and vanilla, then chamomile and verbena, then smoked/salted lemon juice. Actually, I really enjoy this. With water: yes, really good, just a little simple. It’s rather the sweet oak that speaks out, but that works. Its just that you don’t feel much ‘time’. Finish: medium to long, certainly quite American-oaky. Pineapple in the aftertaste (see…) Comments: there is a wee feeling of whisky ‘made in the lab’, but technically speaking, it’s perfect. SGP:545 - 83 points. 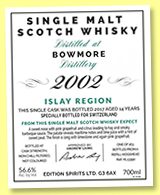 Bowmore 14 yo 2002/2016 (50%, Hunter Laing, Old Malt Cask, refill hogshead, cask #12765, 341 bottles) This one shouldn’t be doped. Colour: white wine. Nose: they’ll call me Nostradamus one day. Indeed, this is much closer to the spirit, sharper, cleaner, better chiselled, with more brine, smoke, oysters, hessian, and just anything from the ocean. Including diesel oil and old tarry ropes. With water: … and Islay mud after the rain. So, every day ;-). Mouth (neat): impeccable. Brine, lemon, smoke, mezcal, and rather more medicinal notes than in other Bowmores. Antiseptics. With water: no literature needed, this is perfect Bowmore, close to the distillate. And the distillate being splendid, why hide it behind planks? I mean… Finish: medium, clean, zesty and salty, all perfect. Comments: what it’s not is ueber-complex. But in cases such as this one, nobody should care. After all, it’s only 14. SGP:457 - 90 points. Bowmore 14 yo 2002/2016 (46%, Chieftain’s, hogsheads, casks # 815801-815810, 3615 bottles) From this lovely series by Ian McLeod, formerly known as Chieftain’s Choice. Colour: white wine. Nose: well, I’m wondering why the distillers themselves do not have such bottlings. Crisp, pure, and close to the distillate. Distillers => distillate, wouldn’t that make sense? But enough with those stupid rants, this is just classic, very nice, fresh, and coastal Bowmore. Smoke, leaves, lemon, seawater, shells… Mouth: this is simply fully Bowmorean. Bowmoresque? Bowmory? Lemons, seawater, kippers, and lime and grapefruits. Perhaps one drop of passion fruit juice, for the record. I could drink the whole batch, seriously. Finish: medium, a tad saltier. Excellent. Comments: … it’s like if you owned a new 911, you wouldn’t add any tuning accessories, would you? SGP:457 - 88 points. Bowmore 20 yo 1996/2017 (51.5%, Douglas Laing, Old Particular, refill hogshead, cask #11590, 291 bottles) Colour: white wine. Nose: there. With water: there. Mouth (neat): there. With water: there. Finish: there. Comments: seriously, this is another well-chiselled, yet rather (even) more angular than others Bowmore, with chalk, lemons, smoke, citrons, and, most importantly, many sweet and fruity herbs. There’s some fresh apricot jam, something that’s rarely to be found in Bowmore, in my meagre experience. The whole’s extremely good. Just totally love it (I think you made your point, S.) Also love the medicinal side (antiseptics, again – this will cure you). Bottles of this needed. SGP:557 - 91 points. Bowmore 30 yo (56.1%, Hunter Laing, The Kinship, refill hogshead, 507 bottles, 2017) We’ve already found some superb whiskies in this series by HL, but a 30 yo Bowmore that was bottled this year may contain some of those foul vintages… Ah the 80s! Shall we find some FWP (copyright Brian)? Or not? Colour: gold. Nose: well, the answer is yes and no. There is this feeling of ‘a new pack of lavender sweets’, and perhaps even a little air freshener, and even raspberry gums, but the rest survived, with nice notes of old ropes, musty wine cellar, and heather honey (loud and clear). With water: chalk and incense, with a cologne-y side. Mouth (neat): really a matter of taste. Smoked heather and lavender, burnt herbs… Not too sure, really. With water: raspberry syrup, whacky herbs, scented soap. Finish: quite long. Orange syrup and more lavender stuff, plus toothpaste for kids. Comments: probably one of the best within those vintages, the problem is that I just hated those vintages at Bowmore. We found the lame duck within the Kinship series! (remember, a personal opinion only, some friends really like this period). An acquired taste, as they say; well as far as I’m concerned, I never quite acquired it. SGP:643 - 78 points. Bowmore 14 yo 2002/2017 (56.6%, Hunter Laing, The First Editions, hogshead, cask #HL13390, 263 bottles) Colour: white wine. Nose: there, some perfect, very vertical Bowmore, with lemon grass, smoke, mercurochrome, seaweed, lemons, kippers, linseed oil, and seaweed (you’ve already mentioned seaweed, S., time to say night-night). With water: aluminium can and kiwi juice. Mouth (neat): wonderful, impeccable, thrilling, amazing (I have to make compensation for the Kinship’s score, you know). Seriously, it’s the most bitter one, and one of my favourite. We’re bordering manzanillaness. With water: perfect smoke, lemon, and ‘stuff’. I could drink the whole batch (once I’m finished with the Chieftain’s). Finish: medium, clean, zesty. Notes of green olives, that is nice. Perhaps a little lavend… I’m joking. Comments: simply perfect, and perfectly simple. Goodnight. SGP:456 - 89 points.